This has been an eventful year. Research with Christopher Chippindale (and published in 2000) had presented indicators for the "history" and "archaeology" of antiquities. One of the contemporary collections that we had explored had belonged to Barbara and Lawrence Fleischman: it was subsequently sold (or donated) to the J. Paul Getty Museum. Part of the Fleischman collection was returned to Italy from the Getty in 2007 confirming our earlier hypothesis. Peter Watson has drawn attention to the role of Giacomo Medici. Watson's exploration of the movement of antiquities has created the climate in which North American museums have agreed to return objects to Italy. The expanded Getty list reflected a willingness to resolve the dispute (and see the discussion of the 2006 list). To these have been added antiquities from the Princeton University Art Museum and the University of Virginia Art Museum in Charlottesville. But objects have not just been recovered from public institutions: some have been returned from a North American dealer (Royal Athena Galleries) and a Swiss private collection. A selection of these pieces have just gone on display in Rome this December. These objects have lost their archaeological contexts, and one of the main reasons for their return will be to deter museums and private collectors from acquiring recently-surfaced objects. Yet the sale of the Guennol lion at Sotheby's has perhaps encouraged some to see antiquities as a "hot" investment. Auctions continue to be an important outlet for antiquities. The decision by Bonham's to withdraw a Lydian silver kyathos from its October sale is a reminder that suspect pieces do still emerge on the market. Bonham's do not so far seem to have offered an explanation of how the piece was offered for sale. A restraining organisation for the market should be the Art Loss Register. Can recently surfaced antiquities be offered certificates with any sense of security? 2007 has seen the closure of the Illicit Antiquities Research Centre in Cambridge though I expect Colin Renfrew and Neil Brodie will continue to contribute to the discussion. Culture Without Context has been an important source of comment and record. One of the solutions to prevent and restrict looting lies in increased legislation and import controls. In 2007 the US government signed a new memorandum with Cyprus. This move, designed to limit the level of looting on the island, has met with fierce opposition from bodies representing coin-dealers and coin-collectors who have taken legal action against the US State Department. The case has served to remind archaeologists that there are strongly-held views on the "right" to collect whatever the material and intellectual consequences. Into this mix have emerged the complexities of forging Egyptian antiquities, and the long-running disputes over cultural property that left their countries of origin before international agreements. Image courtesy of the Princeton University Art Museum. 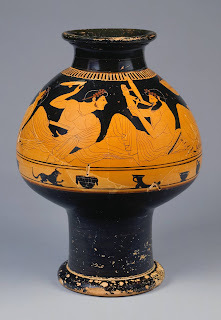 Red figure psykter (ceramic), attributed to the Kleophrades Painter. Greek, Attic, ca. 510-500 B.C. One of four objects to be transferred in title to the Italian government but to remain on loan to the Princeton University Art Museum.